Spring Hill Baptist Church - Stained Glass Inc. When the reverend S. and his committee needed stained glass for their Longview, TX church they came to Stained Glass Inc. The Spring Hill Baptist Church committee had selected a geometric design from a photo of another church. They brought the photo to Stained Glass Inc. and our artisans worked to custom create a unique image based on the design. A full color proof was provided to the committee for their review and they loved the new design even more than the original. Once the image was approved production began and the church stained glass panel was quickly completed. The window insert was delivered and slipped right into place aside the existing church window. Installing the panel took just minutes and brought instant color and charm to the church. 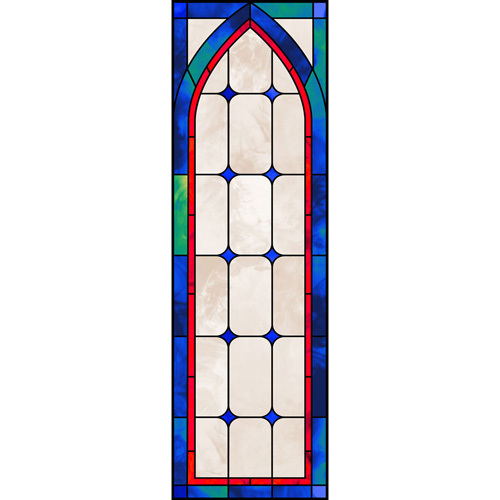 Stained Glass Inc. is proud to be able to help churches like Spring Hill Baptist get the stained glass they want at the price they can afford. "We work hard at producing a quality product at an affordable price," said Lyndon Stromberg of Stained Glass Inc. "We have found that dealing directly, avoiding the middlemen, operating efficiently and concentrating on the needs and wants of our customers is the key to quality products at affordable prices."